In modern city like Chennai, experience the cultural and traditional heritage of the Tamilnadu famous temple. The South Indian ancient temple excites you with the rituals they follow and the beautiful Dravidian architecture. The vast spread temple in the middle of the busy city offers a place for spiritual relaxation and cultural guidance. 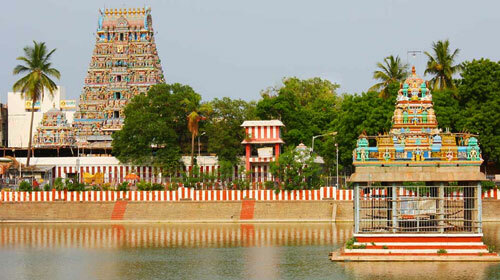 Kapaleeshwarar Temple is located at Mylapore, to the south of Chennai, the capital city of Tamilnadu. The temple is dedicated to Lord Kapaleeshwarar, an incarnation of Lord Shiva. Goddess Parvathy, the consort of Lord Shiva is worshipped as Godeess Karpagambal. Built by the Pallavas, this fine piece of Dravidian architecture is nearly 1300 years old. It is believed that the initial structure of the temple has been demolished by the Portuguese and the present structure was built by the rich Vijayanagara Kings in the 19th century. A 150 feet tall gopuram [entrance gate] is the prime attraction of its brilliant architecture. Coming to the legend of this temple, there is an interesting story behind it. It goes like this “Once Goddess Parvathy asked Lord Shiva the meaning of the holy mantra "Na Ma Si Va Ya". Shiva seeing her curiosity agreed to teach her. While Shiva was explaining the meaning to her, Parvathy saw a peahen and mesmerized by the beauty of it, she got distracted. This made Shiva angry and annoyed by her lack of concentration, Shiva cursed Parvathy to become a peahen. Parvathy in turn to please Shiva, did penance in her peacock form in this temple. This is how the place got its name “Mylapore”, Mayil in Tamil refers to Peahen. That is not it, there are numerous other legends related to the Kapaleeshwarar Temple. In the famous Hindu epic Ramayana, a reference to this temple is made when Lord Rama is said to worship Lord Shiva here. Lord Muruka got his divine weapon the “Sakthivel” from Goddess Parvathy here. Another famous legend involves Lorsh Brahma and Lord Shiva, when Brahma took pride of his creative powers. His egoistic act annoyed Lord Shiva and Shiva beheaded one of Lord Brahma’s five heads and gave it to Brahma telling him that he is taking back Brahma’s creative power from him. Brahma realised his mistake and sought forgiveness from Lord Shiva. He did penance here at the Kapaleeswarar Temple and after a long time, Shiva pleased by Brahma’s devotion grant him forgiveness and gave back his creative powers. The best time to visit Kapaleeshwarar Temple is during the annual festival Brahmotsavam and the Arupathimoovar festival, which sees tens of thousands of pilgrims flocking at the temple to pay their prayers to the Lord Kapaleeswarar. Temple Timings - The temple timings are 5 am to 12:30 pm and 4 pm to 9:30 pm. Devotees can get Darshan of Lord Kapaleeswarar and Goddess Karpagambal in separate shrines. Free ticket and special ticket [Rs. 50] are available.